Do you have skin redness or brown spots on your face or body? Are you experiencing facial discoloration no matter how many adjustments you make to your skincare routine or diet? 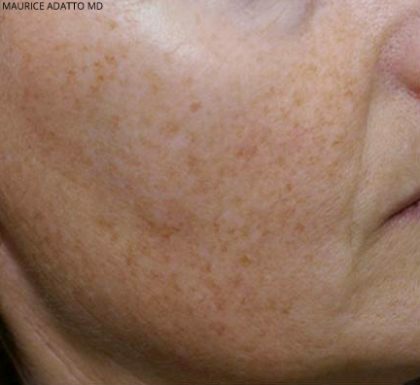 Sun damage accumulates after a lifetime and sometimes there is no way to naturally alleviate facial redness, other skin imperfections like visible veins, and brown spots associated with age. With Cutera LimeLight, skin redness, brown spots and facial discoloration can be treated to give you a brighter, clearer, even complexion! 1 What is Cutera LimeLight? The Cutera LimeLight is an innovative and non-invasive procedure that helps rejuvenate your skin. This advanced technology is a new approach towards skincare and serves as an elegant defense against the physical signs of aging and photodamage. Do you feel younger than you look? If you desire the chance to take control over your physical appearance by reducing skin redness, eliminating tiny veins, or eradicating age spots then the Cutera LimeLight is the perfect treatment for you! 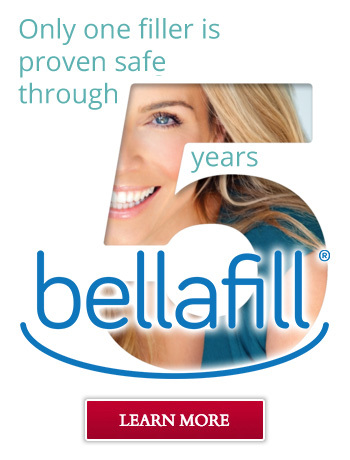 Revitalize your appearance by renewing your skin and restoring it to a more healthy, youthful state. After your first treatment, your skin will be glowing and you’ll wonder why you waited so long. Skin rejuvenation has never been more possible through the amazing technological advances that have brought us the Cutera LimeLight. Improve your skin tone and rectify surface imperfections so often associated with aging and photodamage with the LimeLight facial treatment. This advanced technology is a leading choice for patients desiring skin rejuvenation because the LimeLight laser is completely customizable and capable of treating many types of facial aging and blemishes. Whether you are an older patient interested in eliminating age spots and sun damage or a younger patient who wants to improve your uneven skin tone, the Cutera LimeLight treatment is an effective option. The Cutera LimeLight’s advanced technology enables unique customization for a range of different skin tones and skin conditions associated with age, which is why the Cutera LimeLight is a leading choice for non-invasive, anti-aging skin treatment. At Bridgetown Aesthetics, Dr. Roby F. Hayes, M.D. 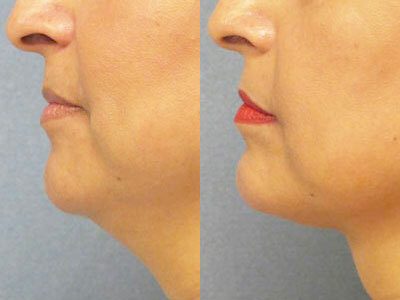 and his dedicated team are pleased to offer a treatment that consistently provides beautiful results. The Cutera LimeLight is a highly advanced method for patients interested in improving their skin tone as well as surface-level imperfections associated with aging and photodamage. For patients experiencing benign pigmented lesions, vascular lesions including telangiectasia, rosacea, port wine stains and angiomas, Dyschromia, Poikilothermic, and symptoms associated with mild to moderate inflammatory acne vulgaris, the Cutera LimeLight offers advanced light treatment that is both comprehensive and non-invasive. Additionally, many patients are susceptible to photodamage, which is caused by exposure to ultraviolet (UV) radiation from tanning beds but also from general sun exposure and factors like: the time of day, the season, distance from the equator, altitude, cloud cover and even presence around reflective surfaces like water, snow, sand, and city pavement. 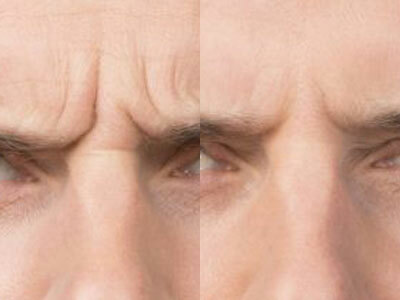 Unfortunately, no one is immune to the damaging effects of the sun or the body’s natural aging process. However, Bridgetown Aesthetics offers a range of non-invasive treatments and procedures that actually rejuvenate and refresh the skin. The Cutera LimeLight is a highly effective method towards skin rejuvenation; it’s a top choice for patients seeking to improve the various imperfections associated with aging and photodamage. Don’t let your skin make the world think you are older than you feel! Rejuvenate your skin and reclaim your youthful appearance by learning more about the LimeLight treatment today. The LimeLight Facial is a straightforward approach to skin tone improvement, remedying surface-level imperfections, and general recovery from aging and photodamage. The Cutera LimeLight treatment is ideal for your face, neck and décolleté (neckline or collarbone) area. This medical grade, non-invasive light treatment is designed to restore each treatment area to reflect a more youthful, attractive appearance. Patients seeking to combat age spots, skin redness, sun damage, and the appearance of tiny veins should contact our office to schedule a one-on-one consultation. If you are experiencing skin redness, telangiectasia, brown spots or low contrast spots, then you are a strong candidate for the LimeLight treatment. Typically, patients experiencing the aforementioned physical characteristics of these common signs of aging and photodamage will respond quite well to treatment. At Bridgetown Aesthetics, we are proud to offer a full assortment of non-invasive aesthetics treatments with medical expertise in a professional, comfortable environment. 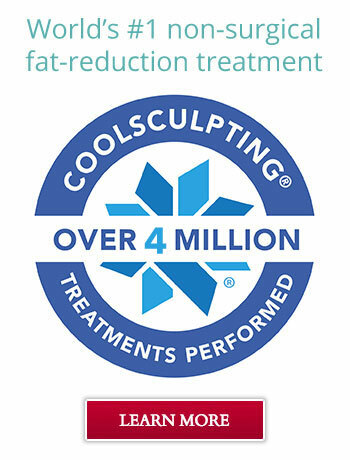 Our goal is to help you look and feel your best, with treatment plans tailored to meet your needs. Once you’ve decided to take the first steps towards the Cutera LimeLight treatment, it’s time to schedule a private consultation with Dr. Hayes and the experienced medical team at Bridgetown Aesthetics. We are dedicated to helping you look and feel your best, with customized treatment plans tailored to meet your exact needs and goals. During your consultation, our expert medical staff will listen to your unique aesthetic goals and determine whether or not you are an appropriate candidate for the Cutera LimeLight treatment. 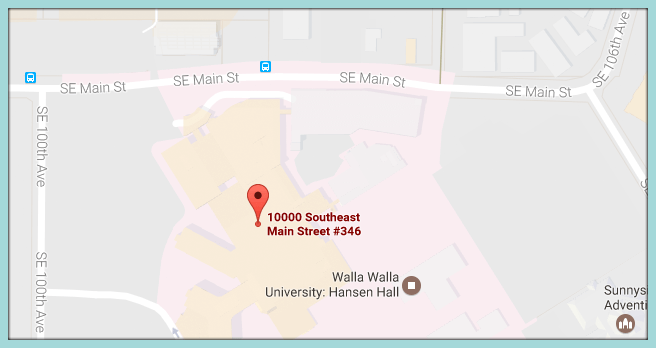 During your private appointment, a facial treatment expert will examine the area(s) you want to have treated as well as your medical history. There are specific considerations our medical team must make in order to avoid any unnecessary complications, as well as always prioritize our patient’s health and wellbeing above all else. However, it’s important to know that the majority of men and women who inquire are typically deemed to be qualified candidates. Once approved, the Cutera LimeLight treatment will take place. Dr. Hayes always applies his medical expertise and aesthetic talent towards overseeing your individualized treatment plan and to personally perform more invasive delicate procedures. There is no anesthesia or pain medicine required for this treatment and patients typically do not feel any abnormal pain during or after the procedure. Before the treatment begins, your expert technician will administer a cooling gel to alleviate any stinging or mild pinching sensations you may experience from the initial pulse of light delivered via the procedure. 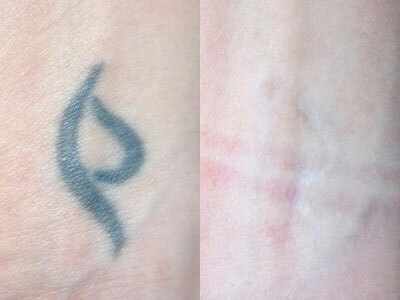 The LimeLight treatment has a very low complication rate and is safe when performed by a qualified practitioner. Treatment time will depend on the area(s) of the body that is being treated. 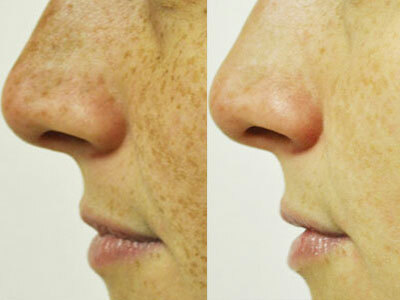 Usually, the Cutera LimeLight treatment does not take more than an hour. In order to experience optimum results, Dr. Hayes recommends that each patient commits to at least one to three treatments, whereas additional treatments may be necessary to see sufficient results. Your Cutera LimeLight practitioner will select Program A, Program B or Program C depending on your unique needs, including skin type, skin damage history, and aesthetic goals. Each program option corresponds to the specific heating level required to treat the pigmented cells in each area(s). 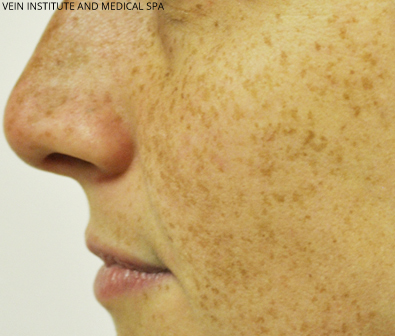 Immediately after your Cutera LimeLight treatment, patients will begin to observe their brown spots growing darker or even somewhat red. The treatment area(s) may experience mild swelling. However, these reactions are totally normal and should subside after a few hours or a day. 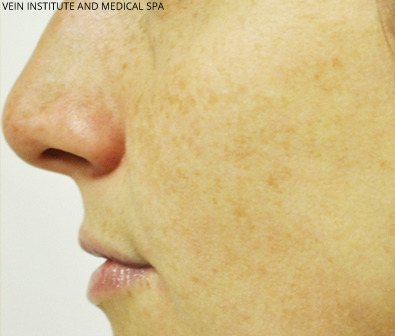 Over the course of one to three weeks, any dark spots will begin to fade and flake off. If significant flaking occurs beyond what is considered normal, an antibiotic ointment such as Polypore or Bacitracin may be recommended. Dr. Hayes and his expertly trained medical staff advise that each patient that for optimum results you avoid direct sun exposure, tanning beds, any skin irritants, and waxing or depilatory treatments. After treatment, Telangiectasia or general redness will decrease and your complexion will begin to improve as quickly as 24-48 hours. The LimeLight treatment has a very minimal downtime and many patients return to work or their regular schedules the very next day. The Cutera LimeLight is a leading choice for restorative, non-invasive facial treatment and not a preventative method against future aging or photodamage. 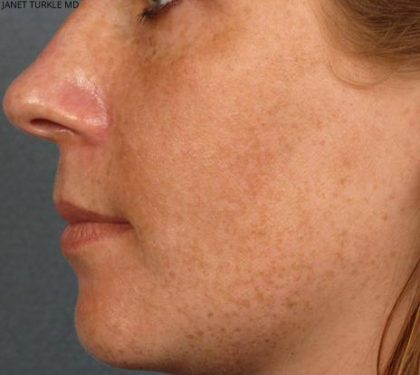 It’s important to note that new brown spots, redness or telangiectasia may appear with sun damage, which is why patients should know that the LimeLight facial procedure is always available for future treatments. Dr. Hayes advocates for the continuous usage of broad-spectrum sunscreen, which can help minimize sun damage, new age spots, and helps to diffuse any redness. 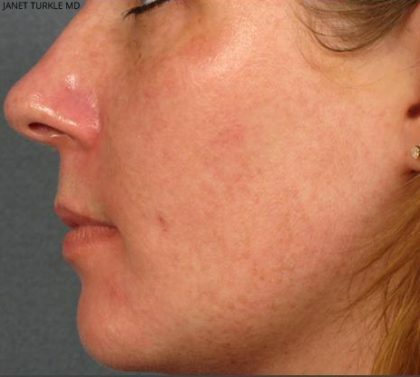 Additionally, Rosacea is chronic ailment and cannot be cured with any laser or light source treatment. 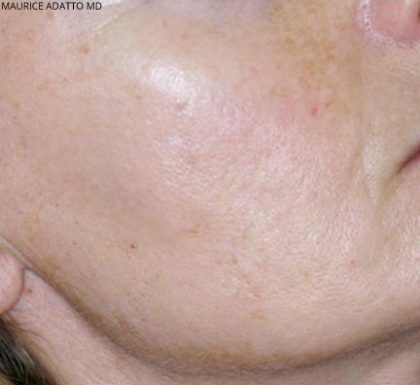 However, the redness associated with this common skin disease can be improved with the LimeLight treatment. The Cutera LimeLight treatment is exceptionally effective as a skin rejuvenation method and can be completely customized for different skin tones and skin conditions. The overall cost of Cutera LimeLight treatment depends on each patient’s specific case, treatment area, and whether or not any additional procedures or treatments are desired. To receive a personalized quote for your Cutera LimeLight treatment, please schedule a private consultation at our Portland office today!